If you have any questions please do not hesitate to contact our advertising manager, Tessa Ryan on sales@waihekegulfnews.co.nz, or phone 09 372 5055. Advertisements should be supplied as PDF, or as a high resolution .tiff or .jpeg Please supply as CMYK colour or greyscale (not RGB). Please create at the correct size and convert all text to outlines. WE CAN MAKE UP YOUR ADVERTISEMENT for you. Email us your copy, or bring it in on a disk along with any logos/images required. We can also scan photos and images if you bring them in. NOTE: Microsoft Word documents are not camera-ready copy and will sometimes not open or print correctly. If providing a Word document (or any other word processor document) please also provide a printed copy. Text must not be below 10.5 in typeface size. Please use your name and invoice number for reference. 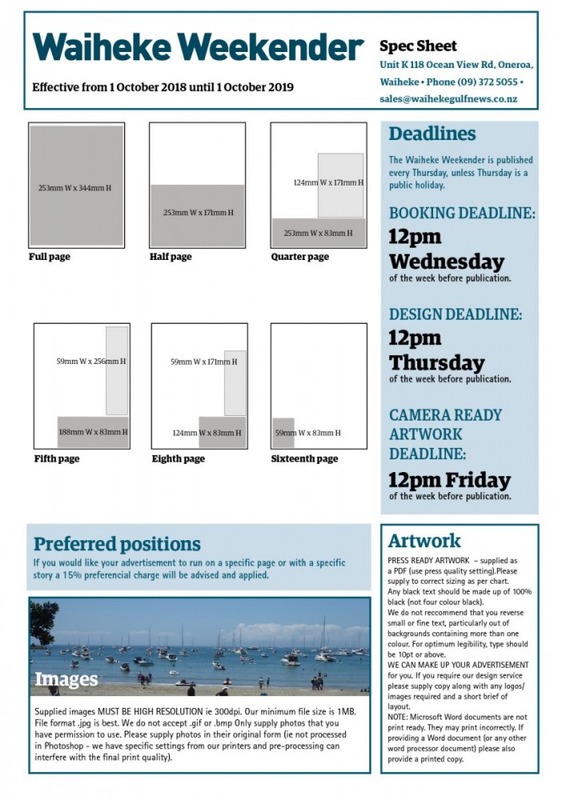 ADVERTISING COPY DEADLINE: Gulf News 12pm Monday on week of publication. Waiheke Weekender 12pm Wednesday on week before publication (if ad makeup is required), 12pm Friday on week before publication (camera ready ads). Deadlines will change around public holidays. CONFIRMATION: If you have not received a confirmation for your display ad booking by 2pm Tuesday, please phone the office on 372 5055. CONDITIONS: 1. CONTRACTS: All contracts and offered prices are prepared on the basis of information provided by the customer, and it is assumed that this information is accurate and that when material is provided with the order, it will be in the specified form. Gulf News is liable for written quotations or contracts and not for any verbal quotations or representations. 2. ACCEPTANCE: placement of order shall constitute acceptance of Gulf News’s conditions of advertising. 3. GOODS AND SERVICES TAX: The customer shall pay goods and services tax at the rate applying. 4. AMENDMENTS: On placement of an order, any deviation from specification as set out in the Contract may result in additional costs to Gulf News. Such costs will incur an additional charge to the customer. 5. LATE MATERIAL: Where the customer fails to meet an agreed production schedule with the supply of copy or other materials to Gulf News, additional costs may be incurred and these will be charged to the customer at the rate of $800 per hour charged in 15 minute intervals. 6. THE CUSTOMER’S INSTRUCTIONS: It is recommended that the customer should confirm all instructions in writing, as Gulf News shall not be liable for errors or omissions relating to misinterpretation of the customer’s verbal instructions. 7. PROOF APPROVAL: Gulf News shall not be liable for errors in the finished work where a proof has been submitted in advance of production and approved by the customer. representation as to its ability to interface, read or use disk input and assumes no liability therefore. Any additional translating or programming necessary to the customer-supplied electronic files will be subject to an additional charge. 9. SUSPENSION OR CANCELLATION OF CONTRACT: Should any contract be suspended or cancelled at the customer’s instructions, Gulf News shall be compensated for the expenses incurred and otherwise protected against loss. 10. CLAIMS: Any complaint must be confirmed in writing within seven days of the date of publication. Beyond this no claim shall be recognised. 11. CONSEQUENTIAL LOSS OR DAMAGE: Gulf News’s liability – in contract or in tort – is limited to the reinsertion of the order free of charge or a refund at the order price. Gulf News will not be liable for any consequential, indirect or special damages or losses whatsoever. All other warranties are expressly excluded. 12. ARTWORK: All advertisements and artwork prepared by the staff of Gulf News remain the property of the publisher and must not be used in any other publication or for any other purpose without prior permission. 13. ILLEGAL OR DEFAMATORY MATTER: Gulf News shall not be required to print any matter which in Gulf News’s opinion is or may be illegal or defamatory in nature at breach of the Fair Trading Act 1986 or any other statute or provision thereof. Gulf News shall be indemnified by the customer in respect of any claims, costs and/or expenses arising from or out of any illegal or defamatory matter or in breach of the Fair Trading Act 1986 at any other statute or any infringement of copyright, patent or design. 14. THE CUSTOMER WARRANTS that material or information given to Gulf News is accurate, culturally sensitive and not calculated or likely to deceive any person or group of persons. Gulf News shall be indemnified by the customer in respect of any claims, costs and/or expenses arising from or out of any material or information which is not in conformity with these requirements. 15. PAYMENT TERMS: Unless otherwise agreed in writing, all accounts are due on the 20th of the month following placement of advertising. Gulf News may charge interest at commercial overdraft rates on any sum not paid by the due date. Gulf News shall not be obliged to complete any order for placement where payment for any previous order is overdue. Prior to placing an order for goods and/or services with Gulf News, customers are advised to carefully read the following terms under which Gulf News accepts orders for the placement of advertising. Any negotiated change, deletion or modification to the conditions of sale requires the written acceptance of Gulf News’s general manager. 16. CONFIDENTIALITY: The Customer acknowledges the confidential nature of any financial and pricing information disclosed by one party to the other in accordance with these Terms and Conditions (‘Confidential Information’). The Customer accordingly undertakes to keep the Confidential Information confidential and not disclose any of the Confidential Information without the prior written consent of Gulf News. The Customer will ensure that its employees, agents, representatives and advisers observe the terms of this clause. The Customer indemnifies Gulf News against all losses, damages, costs or expenses (including Gulf News legal costs on a full client lawyer basis) which Gulf News may incur as a result of any unauthorised disclosure of the Confidential Information. This obligation of confidentiality will continue in full force until all of the Confidential Information has entered the public domain and will survive termination of these Terms and Conditions.